The number of accidents resulting from texting and driving has skyrocketed alongside the number of people who use smartphones. Although nearly every state enforces restrictions on texting and driving, statistics indicate that hundreds of thousands of drivers are distracted at any given moment. The result? Thousands of people die every year — and thousands more are injured — because of this deadly practice. When you have suffered harm or injury as a direct result of texting and driving, the law firm of Katherman Briggs & Greenberg may be able to help. Our respected central Pennsylvania attorneys have helped clients in our region recover expenses and damages for over three decades. Learn more about the shocking statistics of texting and driving. Let Katherman Briggs & Greenberg get you the results you deserve. In April 2014, the US Department of Transportation launched its very first nationwide advertising campaign. The expansive campaign targeted viewers through television commercials, radio advertisements and even banner ads. What issue sparked this attention? Distracted driving. April 11 through April 15, officers around the country cracked down on distracted driving, paying special attention to drivers looking at their phone instead of the road. The crackdown was based on earlier campaigns by California and Delaware against texting and driving, between which police officers handed out over 16,000 traffic tickets. The average texting and driving fine in the US is $100, but a couple states hand out fines for far greater. Alaska is perhaps the state that takes the issue most seriously: the maximum fine for texting and driving there is $10,000. Parents might need to step up and play better role models – 53% of parents text while waiting at a red light, and a full 41% even text while their car is in motion. Their children are following suit; 60% of teenagers text while stopped at red lights and 43% do so while driving. On average it takes 4.5 seconds to read or write a text message. During this time, if you are traveling 40 miles per hour, you have effectively driven the length of 16 cars with your eyes shut. 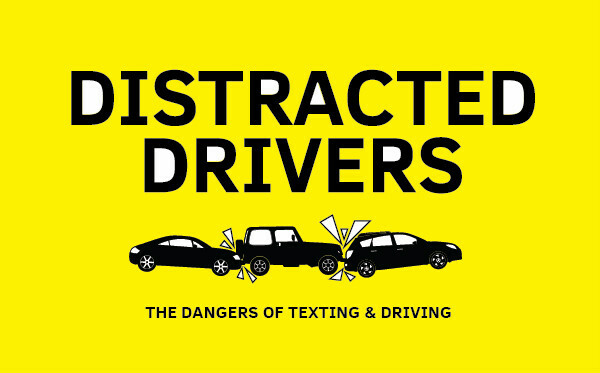 Distracted drivers were responsible for 3,000 crashes and for injuring 387,000 people in 2011. That year, over 3,300 people died because of someone’s decision to text and drive. It is often hard to accept that the actions of another person can cause such serious damage. Unfortunately, the attorneys at our law firm see the consequences of dangerous habits such as texting and driving every day. We gained our reputation for experienced, tenacious representation because we take the damage our clients suffer personally. Our attorneys are among the most respected legal professionals in our region. We pledge to treat you and your case with the respect and attention you deserve. That is why most of our business comes through referrals — not advertising. For over three decades our law firm has exclusively practiced personal injury law. This practice includes recovering damages from texting and driving cases as well as wrongful death, vehicle accidents, products and premises liability and more. When you or a loved one has sustained harm, lost wages or other issues associated with the actions of another party, you have enough to worry about. You should not have to concern yourself with medical bills, lost income or other financial problems. With aggressive representation from Katherman Briggs & Greenberg, you can move on with your life. Every personal injury case is unique. Our law firm is ready to learn more about your case and discuss the best way for you to move forward. Every consultation is confidential. The initial meeting is complimentary. Do not let your texting and driving case become a meaningless statistic. For more information, schedule a consultation with Katherman Briggs & Greenberg. To help spread the word about the dangers of texting and driving, please share the infographic with your friends and family, or use this embed code to publish the infographic on your website. Thanks for sharing this important message.